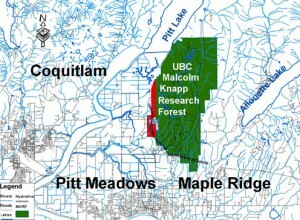 The Malcolm Knapp Research Forest is located in the foothills of the Coast Mountains, approximately 60 km east of Vancouver, British Columbia. The Malcolm Knapp Research Forest is located on the traditional territory of the Katzie First Nation. We thank them for welcoming us to their ancestral lands. The forest itself is 5,157 hectares in size, with an average width (from west to east) of 4 kM and an average length (from south to north) of 13 km. The landbase contains just about every type of terrain found in the lower coastal region of BC. 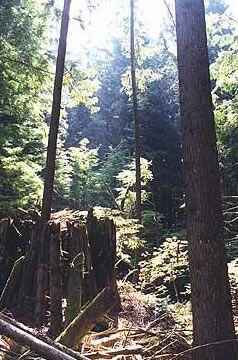 The Forest stretches north and east up the steep slopes of the Golden Ears Mountains to about 1000 m about sea level, west down to sea level at Pitt Lake, and south to the edge of the urban interface in Maple Ridge. As a typical piece of forest land in the lower coastal region of British Columbia, the Research Forest receives a lot of precipitation, mostly in the form of rain–from about 2200 mm per year at the southern end of the forest to about 3000 mm per year at the north end. Snow is rare at the south end of the forest, while the higher elevations to the north are typically snow covered for about four months of the year. This climate has a significant impact on the type of forest growing naturally on our land. The forests are dominanted by coniferous (“evergreen”) trees which are typically large and fast-growing, the most common of which are the Douglas-fir (Pseudotsuga menziesii), the western redcedar (Thuja plicata) and the western hemlock (Tsuga heterophylla). 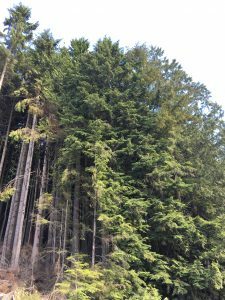 From an ecological perspective, the Research Forest falls entirely into the Coast Western Hemlock (CWH) biogeoclimatic zone, with the lower half of the forest in the dry maritime (dm) subzone, and the upper half in the very wet maritime (vm) subzone. The Forest currently consists of a few separate age classes of forest. On the upper end of the range, some small patches of 400 year+ old growth forest remain intact. The forest age then jumps down to 120-year-old stands, which represent about half of the western side of the forest. Yet another age gap exits between these stands and the 70-year-old stands which cover most of the eastern half of the forest. Forest harvesting since 1949 has led to a range of age classes from 40-year-old second growth to 1-year-old second or third growth throughout the area. A quick look at the history of the Research Forest explains how these age classes came into being.